Loro Park Set in the north of the island in Puerto de la Cruz, this world class animal park is a perfect day out for everyone. 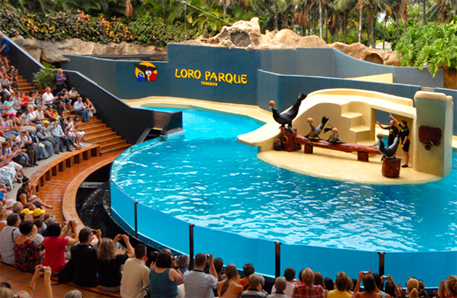 Attractions range from the famous Orca Ocean, Dolphins, Sea Lions, Gorillas, Penguin World and over 700 Parrots, all set in the tropical gardens of Loro Parque. Parque Las Aguilas The Jungle Park in Tenerife is a fantastic zoological and botanical park with over 75,000 square metres of jungle, over 500 animals, walking paths with tunnels, suspension bridges, waterfalls, lagoons, and caves, as well as free flight shows featuring exotic birds and birds of prey. Based in the hills above the Los Cristianos area of Tenerife. Free buses are available to take you from the main tourist areas and hotels to the park itself. AquaLand Set in San Eugenio area of Playa de las Americas is the original Aqua Park of Tenerife, recently added children's attractions, slides and rides, and plenty of sunbeds, the park has a cafeteria, bars and lockers, and a free Dolphin show in the afternoons. Pueblo Chico Pueblo Chico is located close to Puerto de la Cruz, this tourist attraction stands in 20,000 square meters of land and is home to miniature models all of which you will find in the Canary Islands. Dolphin & Whale Watching The south-west coast of Tenerife is a truly outstanding location for the observation of free-living whales as there are colonies of pilot whales and dolphins which remain here throughout the year. They live so close to the coast that Tenerife has become the most important place in Europe for the number of persons who carry out free-living-whale-watching. Jeep Safari The most exciting way to visit Mount Teide and the lost village of Masca can be on the Jeep Safari excursions, leaving from most south resorts, usually travelling in a convoy, get off road and feel the wind in your hair and get to see a little more of the Tenerife country side. Camel Park There are 2 Camel Parks in the south of the island, one just behind the Airport, and the other off the main road towards Los Gigantes. Both parks offer camel rides, with a number of other small attractions for children as well. Horse Riding Club Hipico based 10 minutes outside Los Cristianos in Aldea Blanca is one of the larger farms specialising in Horse and Pony riding. They speak English and offer a number of opportunities from the small children spending 1 hour, to a full days riding. Medieval Knights An evening of medieval activity awaits at the show 10 minutes outside Los Cristianos, join in the fun and cheer for your knights on horseback in the Castle as the show goes on, usually served with a traditional medieval feast without the knives and forks! 10 Pin Bowling Based in Fanabe area of the South, Megabowl is a traditional 10 pin bowling alley underneath Centro Commercial Fanabe. Bowling shoes are provided, but you will need a pair of socks. There is a bar and restaurant on site, along with sports TV. Mikki Play Park Mikki Park play area is based in Fanabe area, above Centro Commercial El Duque, and just opposite the Thursday market area. Open from 11am daily, the area consists of a large ball pool, trampolines, slides, small karting area, bowling and mini golf.